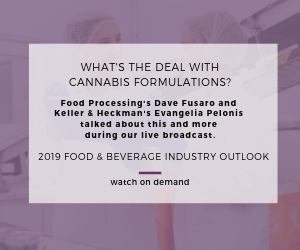 Throughout 2019, one overarching trend will influence not just food and beverage formulations, but also ingredient sourcing, packaging, marketing strategies and commitment to corporate social responsibility. “There continues to be a rise in conscious consumption; this is something we see as being a very lasting trend,” observes Melissa Abbott of The Hartman Group. Conscious consumption extends far beyond health to sustainability and farm-level distinctions, and it spans all generations, says Abbott, who is vice president of culinary insights for the Bellevue, Wash., market research firm (www.hartman-group.com). “Consumers expect food manufacturers to do good and be good, and there has to be ultimate transparency,” she emphasizes. Similarly, Austin, Texas-based Whole Foods Market pegs “Purchases that Empower” among leading food trends for 2019, noting that social justice issues are growing in importance. In its latest “top 10 food trends” list, the Amazon-owned retailer singled out two companies for commendation. Greyston Bakery, Yonkers, N.Y. was cited for practicing an “open hiring model – no questions asked,” thereby providing employment opportunities for former prisoners who’ve served their time and other disenfranchised people. Oakland, Calif.-headquartered Kuli Kuli produces moringa nutrient powder sourced from moringa oleifera trees organically grown by women’s farming cooperatives in South Asia and Africa. But helping to right the world’s wrongs certainly isn’t the only driver of consumption; contemporary consumers of all ages increasingly love to try something new and different. That’s why Innova Market Insights has named “Discovery: The Adventurous Consumer” as its No. 1 global food and beverage trend for the new year. “This is a big, broad trend, and it manifests itself in many different ways,” says LuAnn Williams, Innova’s director of innovation. Manufacturers are responding to the discovery trend with innovative and quirky new flavor combinations that often borrow from other food & beverage categories and are influenced by ever-more exotic frontiers in international cuisine. Williams highlighted a few examples, such as Unilver’s recently introduced Culture Republick brand, which includes several flavors of light probiotic ice cream: Turmeric Chai & Cinnamon, Cold Brew & Chocolate Chai, Pistachio & Caramel, Lemon & Graham, Chocolate & Cherry, and Matcha & Fudge. Another interesting example, according to Williams, is Mars Inc.’s Skittle Sweet Heat line, which encompasses the candy flavors Fiery Watermelon, Sizzlin’ Strawberry, Flamin’ Orange, Blazin’ Mango and Lemon Spark. Likewise acknowledging that consumers want “to explore more of the world through their palates,” Whole Foods recognizes “Pacific Rim Flavors” as the topmost food trend for 2019. “Ingredients like longganisa (a Filipino pork sausage), dried shrimp, cuttlefish and shrimp paste are on restaurant and home menus that span from breakfast to dinner, while vibrant tropical fruits such as guava, dragon fruit and passionfruit are making their way into colorful smoothie bowls and cocktails,” the retailer states. David Marcotte, senior vice president of operations for Kantar Consulting’s Strategic Advisory Services (consulting.kantar.com), agrees that beverages offer a fun, cost-effective and less-risky space for exploring new flavors and ingredients. Beverages also provide an ideal way to deliver vitamins, minerals and other healthful substances. In 2019, Marcotte expects to see continuing proliferation of “every imaginable flavor of seltzer” and more and more iterations of distilled and nutrient-infused bottled water, following the lead of Glacéau Smartwater, now owned by Coca-Cola Co. “Cold-brew ‘anything’ will also remain a huge hit,” he adds. Kamen notes how spicy food has evolved in the U.S. from the traditional Tabasco sauce, which he calls hot for hot’s sake, to more flavorful sauces and dishes such as sriracha and sambol. “These are spicy but also have elements of garlic and smoke and sweet,” he observes. Despite not being legal at the federal level in the U.S., cannabis food and beverages are a nascent trend, observes Amy Marks-McGee, a flavor and fragrance consultant and founder of New York City-based Trendincite (trendincite.com). “As more and more states legalize cannabis and cannabidiol (or CBD), we’ll see more food and beverage launches,” she says, noting that this is beginning to occur in Canada, which legalized recreational use of marijuana this past fall. For example, Molson Coors Canada and Canadian cannabis producer Hexo have a joint venture to develop non-alcoholic cannabis-infused beverages for the Canadian market. The preference for more-natural and less-processed ingredients and food also will continue, although non-genetically-modified “clean label” products have become an expectation rather than a consumer rallying cry or a key brand differentiator. Natural sea salts, for example, “are becoming the standard in many consumable products across various categories,” according to Lola Castle of SaltWorks (www.seasalt.com), Woodinville, Wash. “Choosing an all-natural, unrefined sea salt over a chemically processed salt that has been stripped of its natural trace minerals demonstrates commitment to quality and helps bring to the forefront the delicious flavors of any food product,” she says. For years, health and environmental concerns have influenced consumers. But 2019 will be distinguished by an even greater understanding that human health and environmental sustainability are inextricably linked. Mintel points out that to reduce food waste, Tesco became the first retailer in the United Kingdom to introduce a private label brand of juices (called Waste NOT) made entirely from “ugly produce,” which falls outside of the specifications set by supermarkets for fresh fruit and vegetables. Edible straws made by Barcelona, Spain-headquartered Sorbos constitute another example of a company targeting waste, namely single-use plastics, according to Innova’s Williams. Made out of sugar, the edible straws come in a variety of flavors, including strawberry, lemon and cinnamon, and can be personalized with a company’s name or slogan. Perhaps no trend embodies the interconnectedness of wellness and sustainability as much as the plant-based food movement. Although just 3 percent of Americans identify as vegan (up from 2 percent in 2012), according to a 2018 Gallup poll, there has been a surge of interest in vegan food products, driven mostly by flexitarians who are trying to reduce their animal product consumption for the sake of their own and the planet’s health. Indeed, between 2013 and 2017, Innova tracked a 46 percent global average annual growth in food and beverage launches with a vegan claim, according to Williams. Many more people today realize that animal-based agriculture taxes the world’s natural resources while contributing to air and water pollution and climate change, maintains Miyoko Schinner, the president of vegan cheese processor Miyoko’s Kitchen (miyokos.com), Petaluma, Calif., who also serves on the governing board of the Plant-Based Foods Assn. Beyond health and sustainability, “a lot of people prefer the taste of plant-based products to animal-based products,” she says. Miyoko’s Kitchen, which has grown “well over 100 percent” annually since Schinner founded the company in 2013, moved into a larger production facility in December 2017. Last year, the company rolled out two new cashew-based spreads: cultured organic Vegan Cream Cheese in three flavors (Plain Classic, Un-Lox Your Dreams and Sensational Scallion) and three varieties of Vegan Roadhouse Spread (Biergarten Garlic Chive, Spicy Revolution and Cheers to Cheddah). This year, Miyoko’s Kitchen will debut its first line of legume-based slices and shreds. Functional foods and beverages will also gain more traction this year. In fact, some people are having their DNA tested so that a customized wellness diet can be prescribed for them by a specialized nutritionist or naturopath. “Optimized wellness is really about personalization, with consumers becoming more interested in controlling their own biology,” notes Hartman Group’s Abbott.